Worldwide digital spending declined 2% in December to $9 billion, driven primarily by a 21% fall in the premium PC market according to SuperData. The market intelligence firm also reported a "single-digit" drop off in mobile which was offset by a 12% rise in console spending. Fortnite continued as a dominant force in console for the period, driving a 209% increase in the free-to-play segment. 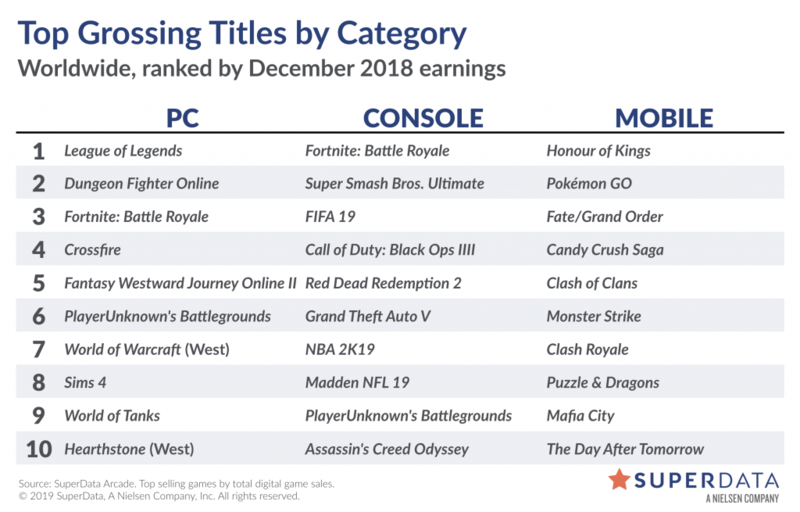 There were no real surprises in the top-grossing games across PC, mobile, or console with League of Legends, Fortnite, and Honor of Kings topping the respective charts for worldwide revenue in December. Fortnite saw its highest-grossing month to date while PlayerUnknown's Battlegrounds sold 2.75 million units across console and PC. Super Smash. Bros Ultimate was the best-selling console game for the month -- with an estimated 2.49 million digital units sold, it's also the best digital launch on the Switch to date. Counter-Strike: Global Offensive is finding solid success since going free-to-play and introducing a battle royale mode, with MAU hitting a high point. SuperData estimates the free version generated roughly $49 million for Valve between November and December. Meanwhile, in the extended reality (XR) markets, Sony is sitting pretty as the market leader ahead of Samsung Gear VR. Annual VR revenue was up 30% last year to $3.6 billion driven by increased adoption rates. SuperData reports that steep Black Friday discounts spurred Q4 unit sales of the PlayStation VR to 700,000, while a $199 price point allowed the Oculus Go to find an audience among first-time buyers with 555,000 units sold during the period. Meanwhile the Oculus Rift moved 160,000 units followed by the HTC Vive which sold 130,000. Looking forward to 2019, SuperData predicts annual XR revenue to reach $11.5 billion. Stephanie Llamas, head of VR/AR at SuperData, said that 2019 will be an important year for VR, suggesting that new headset technology like eye tracking is "likely to accelerate growth of enterprise usage". Games continue to dominate XR, accounting for around 68% software revenue in 2018. Of that, Pokémon Go alone accounted for two-thirds of the total XR games market. In virtual reality, games accounted for 43% of the segment's $1.2 billion software revenue. Finally, SuperData found that location-based entertainment contributed to the industry's substantial growth in 2018, accounting for 16% of annual revenue and attracting mainstream consumers.